Our shipping carrier does not deliver on Saturday or Sunday nor do they delivery to Post Office boxes. APO/FPO and PO Box orders will be shipped via US Postal Service Priority Mail, please allow 6 to 8 business days for delivery. Order tracking will not be available. Due to USPS shipping regulations, certain restricted products cannot ship to these locations (see Restricted Products below for a complete list). Orders shipped to Alaska, Hawaii and the US Virgin Islands will be shipped via US Postal Service Priority Mail (no PO Box/APO/FPO addresses), plus an additional surcharge will be applied; please allow 6 to 8 business days for delivery. Due to USPS shipping regulations, certain restricted products cannot ship to Alaska and Hawaii using USPS Priority Mail (see Restricted Products below for a complete list). Orders containing any Restricted Products will instead be shipped using standard USPS, please allow 4-6 weeks for delivery. We do not ship outside the U.S. at this time (with the exception of APO/FPO addresses and the U.S. territories). *Please allow 7-10 business days for the processing and shipping of an order. If an order contains one of these products, the entire shipment must ship by ground. Additionally, these products cannot be shipped at all to Alaska, Hawaii, APO/FPO locations and PO Boxes. 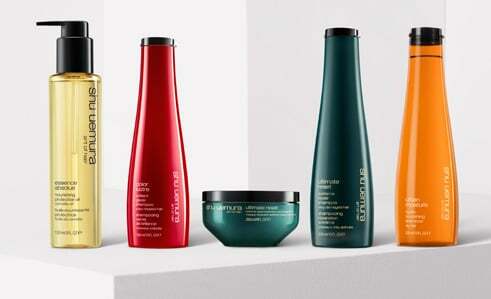 Shu Uemura Art of Hair is pleased to offer free standard shipping to My Shu Style members for orders totaling $85 or more. We regret that we do not ship outside the U.S. at this time. Currently, shuuemuraartofhair-usa.com does not support sending to multiple addresses in one order. Please place the items in the basket that you wish to be sent to one location and send order. You may then proceed to send to another address by beginning the order process again.